The weekend arrived and a little road trip down to Hamilton to catch up with the girls. Great girls, girls I have now know for about 20 years. You know the ones. They have seen you at your best, at your worst and been there through thick and thin, always there if you need them with advice, support or a shoulder. They have been with me for almost half my life and all that is required for the best of times is spending time together. A little vino has also been known to make the odd appearance at these get togethers. With life so busy, families, jobs, these are precious times indeed. Always fun, always uplifting and good for the soul, and always over far too quickly. So if you are lucky enough to have such wonderful friends in your life, make sure to make the time, we can never have enough good times with our best friends. I packed the car up with pate and bread, herbed olives, rhubarb and ginger ice cream plus a little steak to grill up with a fresh parsley and caper sauce. 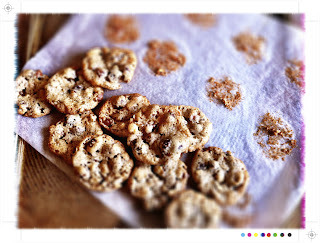 For the kids some cookies, or to be more precise croquants. French and crunchy meringue like cookies bursting with chunks of almonds and hazelnuts. 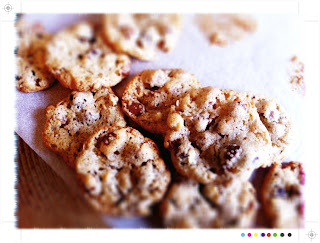 These are the easiest cookies to make I have ever come across. 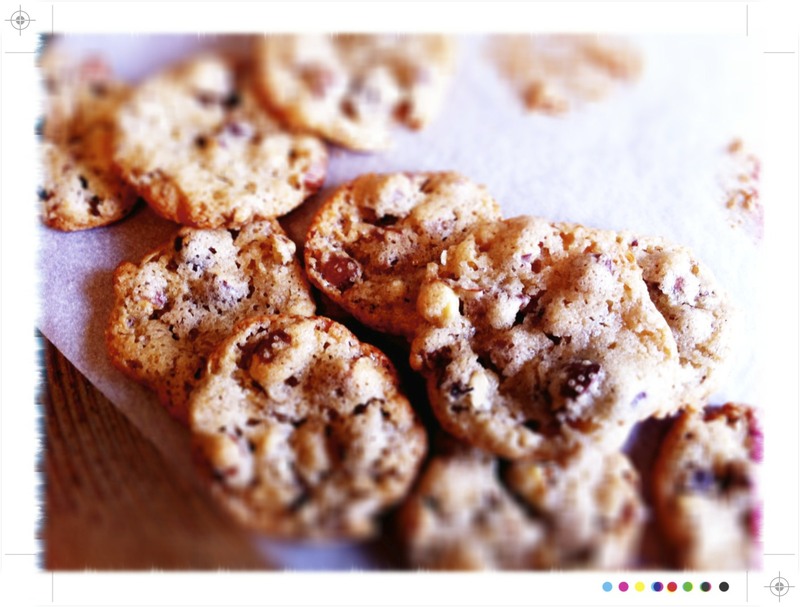 4 ingredients mixed together, spoonfuls dropped on a parchment lined baking tray, in the oven for 8 minutes et voila...crunchy, chewy, nutty cookies fresh out the oven. I can't take credit for this wonderful little recipe that allows you to whip up cookies in a matter of minutes. This is another recipe from Dorie Greenspan's Around My French Table. 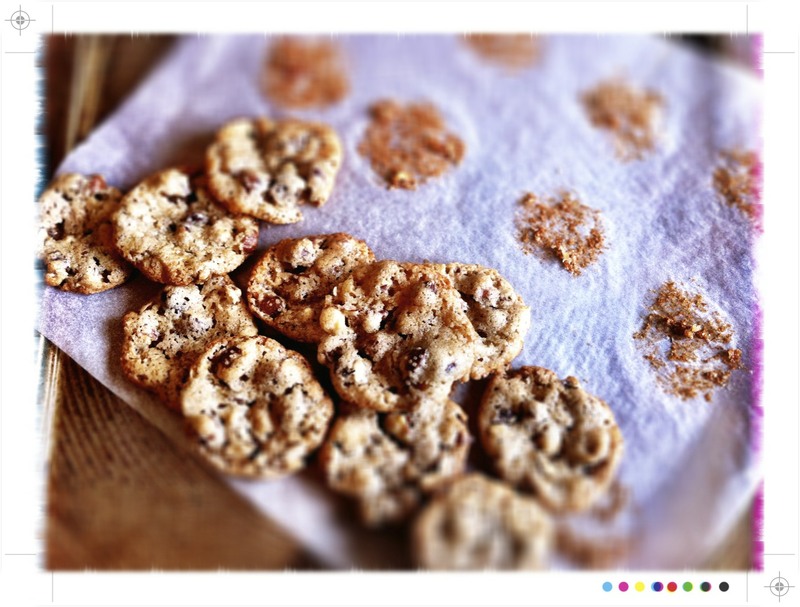 Croquant means crunchy in French and if that is how you like your cookies you will love these. They also offer a great way to use up egg whites post ice cream or lemon curd making. 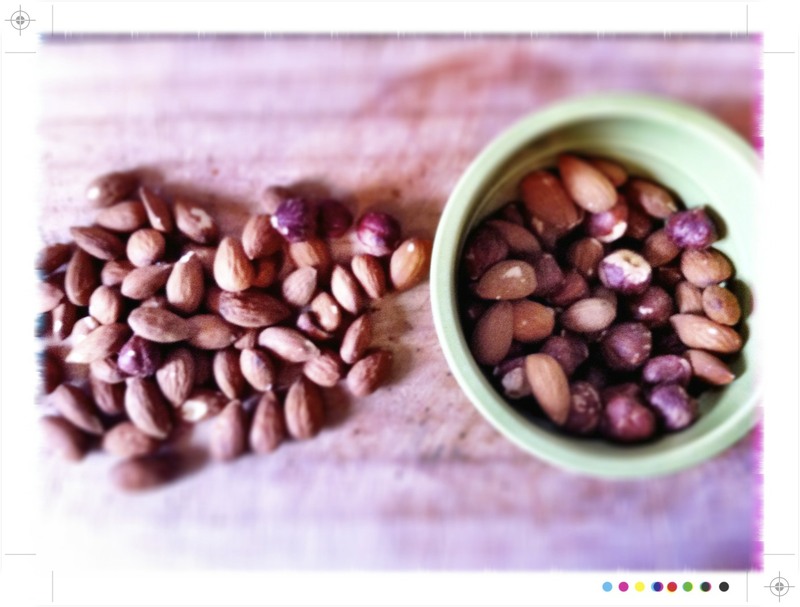 100g / 3.5oz nuts, very roughly chopped. I used a mixture of almonds and hazelnuts, but you can use whatever nuts you like. 1/2 cup plus 1 tbsp all purpose flour, sifted. Preheat the oven to 200C/400F and line a couple of baking trays with baking paper. 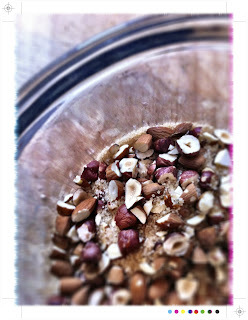 Place the nuts and sugar in a medium bowl and stir to combine. Add the egg whites and mix everything together coating all the nuts evenly. Add the flour and stir to mix it in. You will have a thick nutty mixture. Drop teaspoons of the dough on to the lined baking sheets leaving a couple of inches between each one. Pat down each cookie gently to round it. Bake the cookies for 8 minutes, turning them round half way through. The cookies should be golden, a little puffed and cracked. Transfer to a cooling rack and let the croquants stand for 10 minutes and then they should easily peel away from the baking paper. Let the croquants cool to room temperature, in a dry place for real crunch. Repeat with the remaining dough. So simple, so delicious. Not so dry Auckland meant my croquants were a little crunchy and a little chewy, but as that is how I like meringues that is how I like these cookies too. 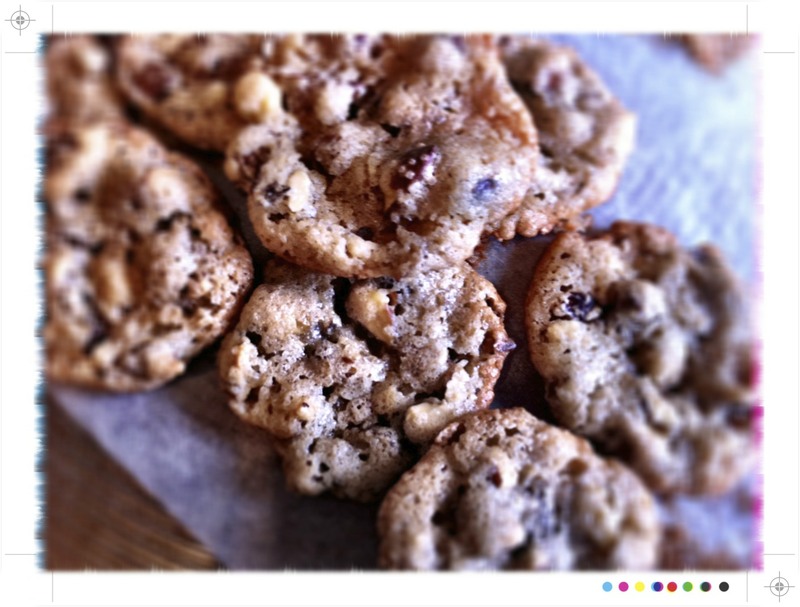 Bursting with nuggets of hazelnuts and almonds I can't even begin to tell you how moreish these are. Yum! 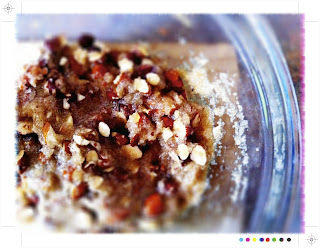 Almond and hazelnuts work well for me :-), and all love all things nutty ! +1! 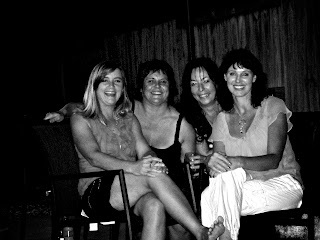 Good to catch up with girlfriends too, very special. I love easy recipes like this - especially that there's no whisking of the egg whites involved! Sounds like a lovely time with your friends - lucky them that they've got you to provide them with such awesome food! these sound delicious we are going to have a lot of things to try when we come.I dont they will do much for the waistline! Such a tasty treat! I find that even though I hardly ever get to catch up with some of my oldest friends any more (because they are all back in Finland), whenever we do catch up it's like we had met just yesterday. True friends! @milliemirepoix Thanks :) love meringues with a little chewiness & yes car full of food is always a priority when heading on a wee road trip! I smiled reading about you and your girlfriends. You are so right, we can never have enough special times with our dear friends! Thank you for sharing these nutty treats, too. WOW 4 things to make these - Amazing! They would be great for Xmas and keep the kiddies busy whilst we relax (not!). I will be giving these ago! Happy weekend - whats happened to the weather though?? ?